The Bay of Tricoenmale or Trinkili-Male, on the East Coast of Ceylon. Plan of Venlos Bay, on the East Coast of Ceylon. This is a fine example of Laurie and Whittle's 1794 nautical chart or maritime map of the Tricoenmale or Trinkili-Male (Trincomalee) Bay and the Venlos (Vandelous) Bay on the east coast of Sri Lanka or Ceylon. Essentially two maps on a single sheet, the upper map details part of the modern Trincomalee District and covers from Dove's Rocks to Coetjar Point. It includes modern day Koddiyar Bay, Shell Bay and Tambalagam Bay. The Trincomalee Fort, built by the Portuguese in 1624 and in 1663 rebuilt and renamed Fort Fredrick by the Dutch is here noted as Tricoenmale Fort. Trincomalee, home to one of the world's largest natural harbors, was captured by the Dutch and the French alternately until finally the British captured the fort in 1795, a year after this map was made. The map also marks the Ostenburg Hills and Fort. Known at the time to be the most powerfully gunned fort in Sri Lanka, the Dutch fort surrendered to the British 1795. 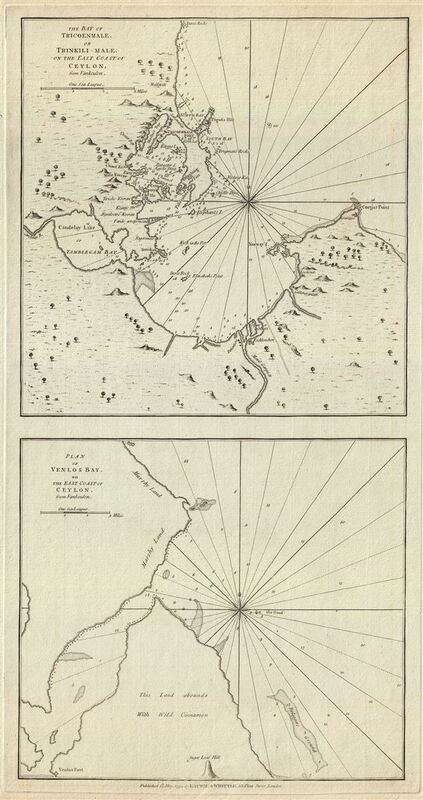 The lower map features the Vandelous Bay, situated north of Batticaloa. It notes the Venlos Fort and Sugar Loaf Hill along with an area where it is noted 'This land abounds with wild cinnamon,' a clear sign of the mercantile intentions of this map.